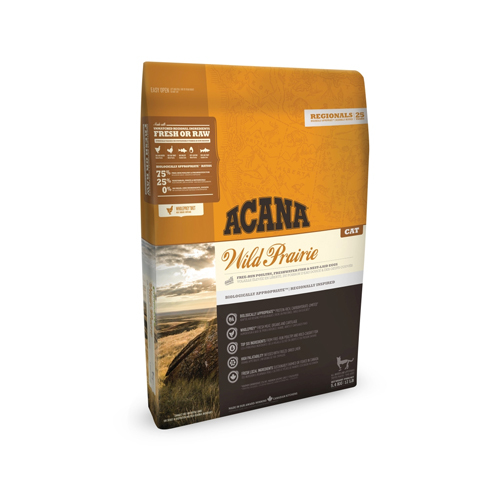 Acana Regionals Wild Prairie Cat & Kitten is cat food for adult cats and kittens and contains chicken and turkey meat supplemented with vegetables and fruit. Cats have evolved as carnivores, with a biological need for a diet that contains a variety of fresh meat and fish combined with a small amount of vegetables, fruits and grasses. The Acana Regionals range is formulated with a variety of ingredients, such as lamb, free-range chicken, free-range eggs and fish from Canada's northern lakes. Wild Prairie Cat & Kitten contains wild-caught fish and freeze-dried chicken and turkey liver. The organic sea vegetables in Wild Prairie Cat & Kitten help absorb toxins from the digestive tract and are also a source of vitamins and minerals. Liquorice and marigold flower support a healthy digestion and metabolism. These ingredients are delivered fresh to Acana's kitchen every day and processed on the spot. Have you used Acana Wild Prairie Cat & Kitten Regionals before? Let us know what you think about this product.